May 18 2014 – Oyster Bay NY – The 4th and final day of Oakcliff’s Spring Invitational Clinegatta dished up some champagne sailing. The final moment of the regatta for Chris Poole and his Riptide Racing team when they came from way behind to pass David Niemann’s Team Honey Badgers to secure the win. Niemann does not go home to Wisconsin too disappointed though, as he gained an invite to the Oakcliff International, the final event in the top ranked Grand Slam series. Poole had previously qualified. 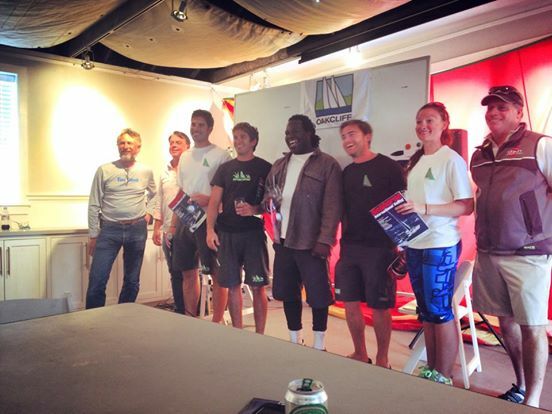 Even though Poole sailing with Chris Kennedy, John Colburn, Ladi Oguntoyinbo and Morgan Keating came out on the top of the scoreboard, no one dominated the week as all teams pushed their limits and sailed exceptionally well. This could be attributed to the fact that all of the teams trained for two very full days of clinic before racing even began. The Clinegatta concept was pioneered at Oakcliff by Dave Perry and this year he stepped it up a notch by observing from onboard on race day 1 and giving immediate feedback after the finish flag. The cliché of a rising tide lifts all ships was actually true as the two days of clinic, individual and then group debriefs had every team throwing around Oakcliff’s Match 40s like they owned them during the 49 races sailed.